The onslaught of family-friendly movies continues in the lead-up to the Primetime for these movies, the Holiday movie season between Thanksgiving and Christmas. The "Variations on a Theme" formula that has dominated this year manifests itself in Universal hoping to repeat the performance of their adaptation in 2000 of a Dr. Seuss book. Rounding out the weekend in the same manner is Gothika, the latest release from Dark Castle, a studio dedicated to the spirit of horror-icon William Castle. 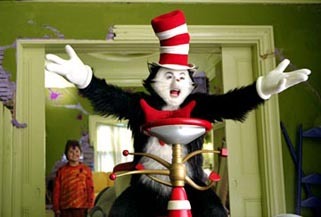 The Cat in the Hat, up in the Pantheon of beloved Dr. Seuss books, gets an adaptation from the same team that made How the Grinch Stole Christmas, released at this time in 2000. Instead of Jim Carrey in green furry makeup, we have Mike Myers in black and white furry makeup. The hyper-luminous set design and color scheme are loyal to Seussian ideals (the director of the film is in fact a production designer making his feature debut, which says a lot) but that may be the only loyalty to the beloved writer this ill-conceived film possesses. Whatever The Cat in the Hat represents, it certainly isn't simply about overactive obnoxious behavior; it was two kids entertaining themselves on a rainy day. Now we have Myers's out-sized performance hijacking the memory of Dr. Seuss without restraint. Someone feed this cat some Ritalin. Now, I'd like to place the blame squarely on the shoulders of Myers and the producers of the film (Brian Grazer, you just made The List) but we, the movie going public, share a lot of blame for this cinematic travesty (it's getting completely savaged on Rotten Tomatoes). The reason this film exists is partly due the success of The Grinch, and partly due to the Austin Powers sequels. This is the end result of indiscriminate film going based solely on a name. Listen, people, just because the movie is based on a children's classic is no reason to think that it's going to be a good adaptation. I realize I'm going against every marketing principle in existence, but fight the shoddy name-brand recognition movies. Tell Hollywood to keep their grubby little fingers off every project they can get by throwing wads of cash at it. The trend is against this film failing; The Grinch scored a $55 million opening weekend and over $250 million domestic despite being every bit as awful as Cat in the Hat appears to be. Austin Powers in Goldmember outpaced The Spy Who Shagged Me by a significant margin despite being completely tired and unfunny. Ticket inflation continues to drive opening weekends up. Universal has thrown their full blitz behind this one, including the inevitable fast food tie-in and heavy-duty merchandising. Clearly, at some point Universal had to have realized that there simply isn't enough material in the book to make a feature-length film (and they barely did that, at 78 minutes). Too bad they went ahead instead of leaving well enough alone. The Cat actually faces some competition for kiddie dollars (though with a Paris Hilton cameo, we're edging away from family values here; if it suddenly switches to night vision, I'm outta there) as opposed to the nearly free reign of The Grinch, and will likely not beat the $55 million with which that first Seuss adaptation got its start. Cat in the Hat has certainly got a wide enough launch, at 3,464 venues. Look for around $47 million and a greenlight for Horton Hears a Who, starring John Goodman. In comparison, as derivative as it is, Gothika is a breath of fresh air. The "stone-cold rational turned crazy" is a pretty standard plot device in your Twilight Zone/Outer Limits shows in addition to having been used on just about every science fiction series in history. It's also borrowing some imagery from last year's The Ring, with the water soaked ghost girl. It's still essentially an original story and the first from the new Dark Castle line to not be a remake of an old William Castle film. Halle Berry plays the psychiatrist who wakes up in her own hospital after apparently killing her husband. She must then figure out how her mysterious visions of a girl who has been dead for four years fit into her apparent loss of sanity, not to mention whether she can really trust her doctor and former colleague, played here by Robert Downey Jr. The quality of this film is all going to depend on its atmosphere and plotting. Word has it leaning heavily towards the former and far, far, far away from the latter. It's also taking a huge beating on Rotten Tomatoes for implausible plotting in an atmospheric package, arranged by director Matthieu Kassovitz (best known as Nino from Amelie). Not that any of this seems to matter for the horror connoisseurs, at least initially, anyway. The Dark Castle films have been solid earners for horror, with even the ridiculous Ghost Ship opening to $11 million. Oscar winner Halle Berry (that still sounds wrong) is easily the biggest star this unofficial series has had and could have kicked it above the $15 million mark where both House on Haunted Hill and Thir13en Ghosts debuted. However, Warner Bros. (who just isn't having a very good November), the actual distribution company, is not showing a ton of confidence in Gothika, opening it in just 2,382 venues, below what the Dark Castle films have opened with previously. This is a bit surprising, considering the fact that the movie has some sharp looking ads and a very hooky trailer. Even on this smaller number of theaters, Gothika should be able to open to around $14 million. Elf continues to skip along in its point shoes, moving up from the number two spot to first place last weekend, a rare achievement of late. While it won't pass $100 million in its third weekend, it'll be very close, The miniscule 15% drop from weekend one to weekend two has positioned it already as one of the films to beat for the holidays. Clearly, Elf is striking a chord with families and will give Cat in the Hat, Haunted Mansion and any other family films over the holiday season some trouble (though there's room for all in December). It probably won't keep the same amazing pace that it had last week, but definitely could see a third weekend over $20 million. That would be two more than The Matrix Revolutions, which is doing its best impression of a felled tree, dropping an amazing 67% from opening weekend. Not only will it not pass the total of the original Matrix at $171 million, but will have to fight for the $150 million mark. It's an inglorious ending to a historic franchise. Master and Commander: The Far Side of the World isn't exactly looking for a franchise designation, but its performance and reception could lead to one. A decent $25 million opening has been met by general approval and Oscar buzz; a $150 million total would not be out of the question for this nautical adventure. It's a good year for water movies, apparently. Love Actually continues to impress and expands further in its third full weekend of release as it moves in to more than 1,600 venues, over triple its starting point. This ensemble romantic comedy is picking up steam in a nice groundswell. Full kudos go to Universal, which can do no wrong in its marketing this year. With a little luck, the studio may be able to guide this one to $75 million and Oscar nominations. Among those films opening in limited release is 21 Grams, a thriller and the English-language debut from the director of Amores Perros. Starring Sean Penn, Naomi Watts and Benicio del Toro, the film brings them together in an accident causing terrific and awful effects through all their lives. This continues a theme of causality and chance that was present in the previously mentioned Amores Perros, which was nominated for Best Foreign Language Film. Also in limited release with Oscar buzz is The Barbarian Invasions, French-Canadian director Denys Arcand's sequel to his Oscar-nominated The Decline of the American Empire. Canada's official entry into Foreign Language qualification this year, it's also captured awards at Cannes and the Toronto Film Festival, both harbingers of late year acclaim.